The new MacBook and MacBook Pro are here. No, not just “here” in the sense of “publicly acknowledged by Apple and being shipped to arrive in Apple Stores tomorrow.” Here in the sense of, in my office right now. So in advance of our full reviews and lab tests of these products, let me give you a quick tour of the products. The big physical differences between the MacBook Pro and MacBook lines are gone with this update. The MacBook looks like a 13-inch version of the 15-inch MacBook Pro. Both of them have the aluminum enclosure and a black screen covered from end to end with glass. Both have the same black keyboard found in the MacBook Air. Both of them are curvy around the sides and bottom, making them easy to grip. Basically they both look like the bigger brothers of the MacBook Air. The Air was clearly the first product in a wave of new laptop designs from Apple, and now we’ve seen the second and third versions. They feel rigid and sturdy, despite their light weight. At first glance, the screens of both models appear to be quite similar—and similar to the MacBook Air’s as well. The LED backlighting is remarkably bright, meaning these laptops are going to be quite usable, even in very bright conditions. Users who are fans of the matte finish on the MacBook Pro are going to be quite disappointed about these new systems’ standardization, iMac style, on a glossy glass-covered display. In my extensive time with the MacBook Air over the past few months, I’ve found that the bright LED-lit screen could overpower just about every bright, glaring location you could think of. The MacBook Pro’s prominent speaker grille holes on both sides of its keyboard are now much smaller, owing to Apple’s new production process. And the MacBook continues to have its stereo speakers embedded right next to the display’s hinge, so that the sound can bounce off the screen. So far as I can tell, the speakers are more or less the same as in past generations. The MacBook Pro, which previously offered most of its ports on its left side—but with a few ports on the right—has joined the MacBook in offering ports on only one side. Both models use the same MagSafe connector found in previous generations; unlike the MacBook Air, which sports a redesigned power adapter due to its unique shape, these models appear to use the same adapters as they did before. The MacBook Pro comes with a larger, 85-watt adapter; the MacBook comes with a smaller 60-watt adapter. Both offer an Ethernet port, two USB 2 ports, audio in and out, and the new Mini DisplayPort monitor port. (DisplayPort is an emerging display-connectivity standard; it’s unclear if Apple’s the first company to offer the “mini” version of DisplayPort, and if it’s an Apple-invented proprietary variation or if it’s something we’ll see in many other computers and displays to come.) Apple says there will be Mini Display Port-to-DVI and Mini-Display-Port-to-VGA adapters available; it’s unclear if support for composite and S-Video connections has been dropped with these systems. In addition to the ports shared by the two systems, the MacBook Pro offers a single FireWire 800 port (yes, you can buy a FireWire 800 to FireWire 400 adapter) and an ExpressCard slot hidden behind an aluminum door. Both models offer a slot-loading SuperDrive on the right side. 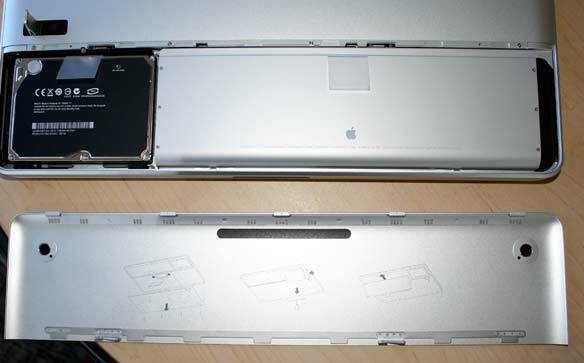 (Previously the MacBook Pro’s slot was on the front.) Yes, this means that the new MacBook joins the MacBook Air in not offering any sort of FireWire connectivity. Two new preference panes. Note the compact-fluorescent bulb. The new Trackpad control panel. Both models use the same keyboard, the one that debuted on the MacBook and then made its way to the MacBook Air. If you love it—or hate it—you probably already know. As for me, I find the feel identical to other recent Apple laptops, even though the look is a bit different. 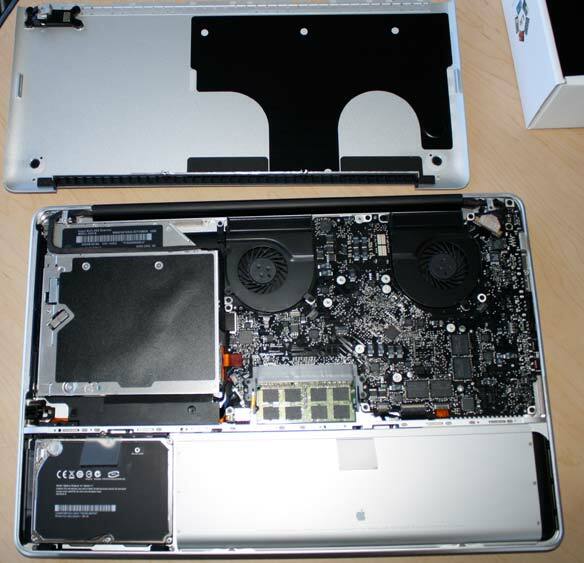 When the original MacBook came out, one of my favorite features was the easy access it provided to its hard drive and RAM, both of which lurked behind a few screws under the laptop’s battery bay. Sadly, the MacBook Pro remained extremely hard to upgrade—until now. These are the most upgradeable Apple laptops yet. Both models are identical in this respect. On the bottom side of the computer there’s a switch you flip up, which releases a metal door. Lift it off, and beneath you’ll find a battery and a hard drive. To remove the battery, just pull up on the plastic tab attached to it and it’ll lift right out. 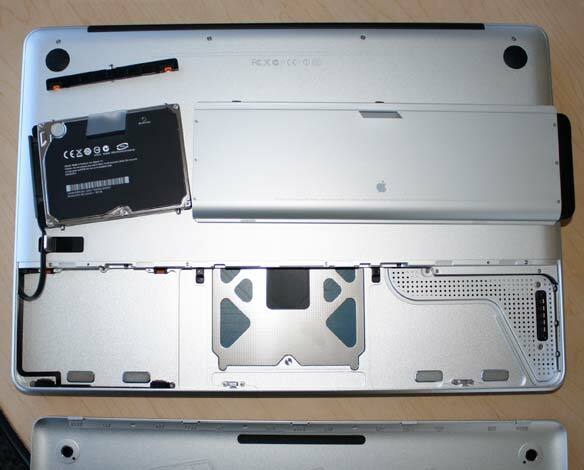 To remove the hard drive, you’ll need a small Phillips screwdriver in order to remove a single screw from a small plastic locking mechanism that sits between the main laptop case and the drive. Then lift the drive out and disconnect it from the drive cable. 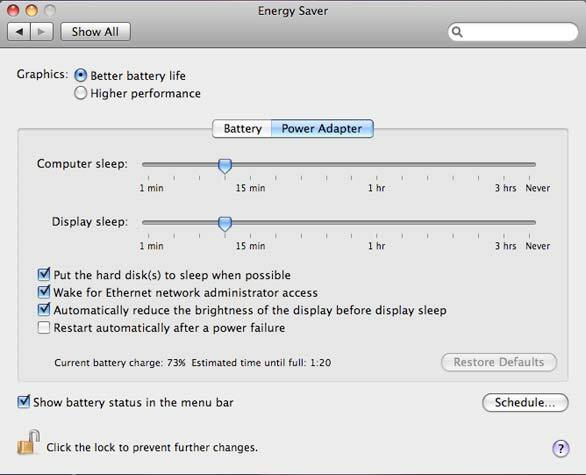 An important note about the battery: it no longer comes with its own battery-level light. (Which would be tricky, since it’s hidden behind the removable door.) Instead, on the left side of both models there’s a small button that you press to see the capacity of the currently inserted battery. You’ll get a more detailed look than in previous models, too: eight tiny battery lights make up the battery-status display. It’s worth noting that while the old MacBook line (still kicking around as a $999 low-end MacBook) let you choose between white and black models, with these new MacBooks you can have any color you like, so long as it’s silver. However, in line with the latest iMac models, it’s a definite silver-and-black look, thanks to the keyboard and the solid black glass face of the display. Even the display’s hinge is black, as opposed to the gray found in the Macbook Air. Not five minutes out of the box and already a software update. Apple crows about the reduced waste in the packaging of these products, and it’s true. They follow the MacBook Air approach: it’s a tiny box with not a whole lot in it. (Not even any video adapters.) But it’s definitely less wasteful packaging. Once I got the computers out of the box, I was immediately slapped with a Software Update notice. Between the installation of software on the systems at the factory in China and their arrival in the United States, Apple’s software engineers evidently fixed some bugs. I was immediately prompted with an alert to update to Version 1.2 of the MacBook, MacBook Pro Software Update for “precision aluminum unibody enclosure MacBook and MacBook Pro notebook computers.” Whew! After a few hours with these systems, I have to say that I like them a lot. The new trackpad takes some getting used to, but I think most users will like it. Lovers of matte displays will be angry, though that anger might be mitigated by third-party anti-glare overlays. And the displays themselves are bright and beautiful, which is a good thing. The new graphics performance of these systems—especially the MacBook, which previously used Intel’s integrated graphics—should be good, though we’ll have to wait for Macworld Lab to weigh in to know for sure. Thus ends my rapid-fire hands-on look of the MacBook and MacBook Pro. Stay tuned later this week for Macworld Lab’s tests of these systems, followed by complete reviews. And when the new MacBook Air arrives in November, we’ll take that one for a spin as well. Jason Snell is Macworld’s editorial director. You can follow him on Twitter. Jason thanks the good folks on Twitter for suggesting so many of the questions he answered in this story.